Last week I had to troubleshoot a strange problem. A developer had broken up the source code for a large class of constants (defining various colours) into separate files using the partial keyword, and all of a sudden our Windows Forms controls were painting themselves black instead of the correct colour. Put them back into one file again and the problem went away. … the test will fail as MyOtherNumber will be 0. Obviously if the two definitions exist in different source files, this type of problem is much harder to spot. The test does pass if we use the const keyword instead of static readonly, but since we were initialising using the Color.FromArgb function, this was not an option for us. The moral of the story is to avoid setting static read-only fields to values dependent on other fields. Or at least be aware of the problems that can arise from doing so. I’ve read a number of blog posts recommending doing a daily TDD ‘kata’ recently. For those unfamiliar with the concept, essentially you attempt to solve a simple programming task using TDD. The problems are often simple mathematical challenges, such as finding the prime factors of a number, or creating a calculator. You limit yourself to 30 minutes to work on the problem. One of the goals of doing this is to speed up the way you work. For this reason, many people recommend doing the same kata many times, just like a musician would practice the same piece daily, gradually improving in speed, fluency and accuracy. There are several benefits to taking the time each day for a coding warm-up. While I think these benefits are great, I do think most of the kata examples I have seen suffer from a weakness. And that is that you are always testing something that is inherently easy to test. After all, what could be easier to write unit tests for than an Add method? This can mean that when you transition to attempting to write tests for your “real” code, you can fall at the first hurdle, as the “arrange” part of your test is horribly complicated, and you have no idea what to do for the “assert” part. Load up the source code of the application you are working on. Choose a class or method that is not covered by any existing unit tests (preferably something you are currently working on). Give yourself a maximum of 30 minutes to create a meaningful unit test. If it passes, check it in, and congratulations, you now have slightly less legacy code than before. If it fails, rollback and get on with your day’s work. Hopefully you learned something from the experience. You could write up a memo on what is wrong with the design of the class you tried to test. And you could always have another go at it tomorrow. 1. Tight Coupling & Hidden Dependencies. You may find that it is almost impossible to instantiate an instance of the class you want to test because of its dependencies (often hidden through the use of singletons). Sometimes your 30 minutes is up before you have even managed to successfully instantiate the class. Classes that fail to adhere to the “Single Responsibility Principle” often fail spectacularly. They are responsible for everything from the printout of wage slips to the launching of nuclear warheads. They talk to the database, the file system, the network, the registry, and create a few background threads too. This means that they typically have dozens of dependencies unrelated to the behaviour you want to test. And when you call a single method you aren’t doing one thing, you are doing 100 additional things, one of which is bound to throw an exception. The best course of action is to extract a single, isolated responsibility and move it into its own testable class. I’ve been doing this “unlegacy my code” kata for a couple of weeks now, and am (very) slowly seeing the unit test coverage rise. The fact that it is directly related to what you are working on also makes it much easier to justify the 30 minute daily investment to your manager. If you are working a large application where you have to simultaneously support hotfixes, service packs and new features for customers running several different versions, while developing new versions of your software, chances are you have some kind of branching structure in your source control system. The first principle is that it is better to make many small, focused check-ins, and merge them early, rather than checking a vast collection of changes in one hit and attempting a gigantic merge after several months of development. Sadly, this is not always possible, as sometimes a major change has to be kept out of a branch for a long time. It is worth spending some time making sure you choose the correct branching strategy. A lot could be said about this, but here’s just two things to consider. Don’t put two major features into one branch unless you are willing to deploy them together. Although you can “cherry-pick” changesets to merge, the reality is that this only works if your changes are completely isolated from one another. In other words if changeset B depends on something that was in changeset A, then you can’t just merge changeset B into another branch, changeset A has to come along for the ride too. Also, avoid getting into the situation where you need to merge between two branches that are not directly related. In TFS, these are called “baseless merges”, and they can result in deleted code getting re-inserted. Nothing messes up a merge more quickly than someone making widespread “cosmetic” changes – introducing or deleting whitespace, renaming things, moving methods to a different part of the file, etc. Sweeping changes like this have a high probability of conflicting with someone else’s change. The solution is of course, to reduce the need for this kind of change by making sure that what you check in is formatted correctly, and follows the appropriate coding standards and naming conventions. Tools like StyleCop, Resharper, and FxCop are all able to help here. Simply put, the Single Responsibility Principle dictates that every class should have one and only one responsibility. If it has two or more, you should extract functionality into additional classes. Similarly every method should perform one and only one task. Adhering to this straightforward principle results in many classes, each composed of short methods. Very often merge conflicts are due to two people working on the same file or method, but changing it for very different reasons. But if a class or method has only “one reason to change”, then the chances of two developers working on different features needing to simultaneously change it are greatly reduced. The Open Closed Principle states that classes should be open for extension but closed for modification. Or to say it another way, it should be possible to add new features and capabilities to your codebase simply by creating new classes, rather than having to mess with the internals of existing classes. And if you use technologies like MEF, it really is possible to add whole new features without touching a single line of your existing codebase. Obviously, in any large real-world application, there will always be the need to make some changes to legacy code. But this should be the exception rather than the norm. In fact, the only real reasons to change the existing code are to fix bugs, and to make it more extensible. If commits to source control of new features consist mostly of changes to existing files rather than the creation of new ones, maybe you need to do some research into how you can better design your classes to conform to OCP. After performing a merge, it is vital that you are able to determine as quickly as possible if you made any mistakes in the conflict resolution process. A unit test suite with good code coverage is invaluable in helping with this task. Obviously this may need to be complemented with further integration testing and manual testing, but the quicker you can identify problems with a merge, the better. So those are my top recommendations for avoiding merging nightmares. Anyone got any other suggestions? It has been well over a year since I last released a version of NAudio, and since then there have been loads of new features and bugfixes added, so I have decided it is time for a new drop. Another reason for releasing now is that NAudio has been getting a lot more attention recently, mainly due to StackOverflow (and even got a mention on This Week on Channel 9). As always, head to CodePlex to download the latest source code and binaries. WaveOut has a new constructor (this is breaking change), which allows three options for waveOut callbacks. This is because there is no “one size fits all” solution, but if you are creating WaveOut on the GUI thread of a Winforms or WPF application, then the default constructor should work just fine. WaveOut also allows better flexibility over controlling the number of buffers and desired latency. Mp3FileReader and WaveFileReader can have a stream as input, and WaveFileWriter can write to a stream. These features are useful to those wanting to stream data over networks. The new IWaveProvider interface is like a lightweight WaveStream. It doesn’t support repositioning or length and current position reporting, making the implementation of synthesizers much simpler. The IWavePlayer interface takes an IWaveProvider rather than WaveStream. WaveStream implements IWaveProvider, so existing code continues to work just fine. Added in LoopStream, WaveProvider32 and WaveProvider16 helper classes. Expect more to be built upon these in the future. I have also started using the WaveBuffer class. This clever idea from Alexandre Mutel allows us to trick the .NET type system into letting us cast from byte to float or short. This improves performance by eliminating unnecessary copying and converting of data. There have been many bugfixes including better support for VBR MP3 file playback. The mixer API has had a lot of bugs fixed and improvements, though differences between Vista and XP continue to prove frustrating. The demo project (NAudioDemo) has been improved and includes audio wave-form drawing sample code. There is now a WPF demo as well (NAudioWpfDemo), which also shows how to draw wave-forms in WPF, and even includes some preliminary FFT drawing code. The WaveIn support has been updated and enhanced. WaveInStream is now obsolete. WASAPI audio capture is now supported. NAudio should now work correctly on x64 operating systems (accomplished this by setting Visual Studio to compile for x86). As usual, I welcome any feedback on this release. Do let me know if you use NAudio to build anything cool. Suppose you want to not just play back some audio, but record what you are playing to a WAV file. This can be achieved in NAudio by creating an IWaveProvider whose read method reads from another IWaveProvider but also writes to disk as it goes. This is very easy to implement, and the WaveRecorder class I present here will be added to NAudio shortly. Our WaveRecorder also needs to be disposable, as we will want to close the WAV file when we are finished. In this post I will demonstrate how to create and play a sine wave using NAudio. To do this, we need to create a derived WaveStream, or more simply, a class that implements IWaveProvider. One awkwardness of implementing IWaveProvider or WaveStream, is the need to provide the data into a byte array, when it would be much easier to write to an array of floats for 32 bit audio (or shorts for 16 bit). To help with this, I have created the WaveProvider32 class (likely to be committed into the source for NAudio 1.3), which uses the magic of the WaveBuffer class, to allow us to cast the target byte array into an array of floats. Using it is straightforward. We choose our output sample rate, the frequency of the sine wave and amplitude. You can even adjust them in real-time. Please note, that you will need to be using the latest NAudio code from source control to use this (until 1.3 is released). 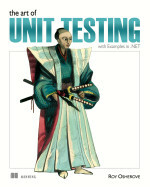 In this book, Roy Osherove gives a comprehensive introduction to unit testing. He explains why you would want unit tests in the first place, how to go about writing and running them, as well as addressing some of the challenges involved in introducing unit testing to projects or development teams. Those who have experience writing unit tests might not find a lot of new material in this book, but it is still worth skimming through as he often provides several ways of achieving a goal, one of which you may not have thought of. Part 1 introduces unit tests and their benefits, and explains how they differ from integration tests. This elementary distinction is an important one as when many developers initially try to write their first unit tests, they actually write integration tests, ending up with tests that are fragile, unrepeatable and slow, and potentially putting them off from writing any more. Part 2 explains how mocks and stubs can be used to enable automated testing. He shows that you can make classes testable using several techniques, not just passing in interfaces for all dependencies. He introduces a few of the most popular mocking frameworks. Part 3 deals with the problem of managing and maintaining all your unit tests. He advocates continuous integration, keeping the tests simple, and presents a useful list of unit testing anti-patterns. Part 4 tackles some of the tricky issues of introducing unit testing into a legacy codebase, or into a development team that is resistant to change. Osherove is a pragmatist rather than a purist. He recognizes that you may have to start very small, and prove that the time taken to write the tests is worth it. Two appendices provide useful additional information on some of the OO design principles that make for testable code as well as summarising many of the open source and commercial unit testing tools and frameworks available. This is a very helpful resource, as it helps newcomers to navigate their way through the bewildering array of choices as well as highlighting some new tools that I hadn’t come across. Overall I would say this is an excellent book to pass round developers in a team that is considering using unit testing or is new to the practice. Doubtless some will be disappointed that he doesn’t stridently demand that TDD is used exclusively, but his honest realism is refreshing and may even prove more effective in winning over new converts to test driven development. Styling a ProgressBar in WPF is actually very easy. You can start with the very helpful “Simple Style” template that comes with kaxaml. You simply need to define the visuals for two parts, called PART_Track and PART_Indicator. The first is the background, while the second is the part that dynamically changes size as the current value changes. To work around this, I painted the entire gradient on the PART_Track. Then the PART_Indicator was made transparent. This required one further rectangle to cover up the part of the background gradient that I don’t want. I do this with a DockPanel. This allows the PART_Indicator to use its required space, while the masking rectangle fills up the remaining space on the right-hand side, covering up the background gradient. I think there may be an even better way to solve this using a VisualBrush, but I can’t quite get it working at the moment. I’ll post with the solution once I’ve worked it out. I’m hoping to write a few brief code snippets to demonstrate various uses of NAudio, to eventually form the basis of an FAQ. This example shows how you can take a WAV file and trim a section out of it. You specify the TimeSpan to remove from the beginning and end, as well as an output WAV file. Please note this will only be reliable with PCM format WAV files. Now to turn it into a template, we follow a very similar process to before. We allow the Background colour to be overriden by the user if required. I couldn’t come up with a neat way of forcing the button to be circular, but it is not too much of a chore to set the Height and Width in XAML. The focus rectangle has been made circular. For the IsPressed effect, I simply change the angle of the linear gradient of the inner circle a little, and move the ContentPresenter down a bit, which seems to work OK. I haven’t created any triggers yet for IsMouseOver, IsEnabled or IsFocused, mainly because I’m not quite sure what would create a the right visual effect. Sadly, the use of ControlTemplate triggers means that this template can’t be used directly in Silverlight. I’ll maybe look into converting them to VisualStates for a future blog post. Of course, I was kicking myself for missing such an obvious solution, but it left me pondering how often this happens without me realising it. … and I know exactly how he feels. In a couple of WPF applications I am working on, I am trying to use the MVVM pattern. It often ends up with me writing code that might be a really cool piece of lateral thinking, or it might be a pointlessly overcomplicated hack. For an example, here’s an attached dependency property (usage here) I created to let me bind to Storyboard completed events. What I need is another person to look over my shoulder and tell me whether I am missing the obvious, unaware of an API, or ignorant of a best practice. But all too often, that person doesn’t exist. In a commercial environment, hopefully there is at least some kind of provision for code reviews to take place, or maybe even pair programming. But what about the lone programmer working on open source projects? Maybe we need some way to “crowd-source” code reviews. Some way of getting lots of eyes on your source code, even if it is only for a couple of minutes, and an easy way of getting hold of that feedback. A bit like fivesecondtest but where you help out an open source developer by code reviewing a changeset. I’ve asked for this as a feature on CodePlex. What do you think? Could it work? How do you make sure you’re not missing the obvious in the code you write? While this approach works, it doesn’t feel quite right to me. It is fragile – forget to set blahEventArgs back to null and you inadvertently break other tests. I was left wondering what it would take to create an Assert.Raises method that removed the need for a private variable and method for handling the event. Having to specify the event name as a string is ugly, but there doesn’t seem to be a clean way of doing this. It expects that your events are all of type EventHandler or EventHandler<T>. Any other delegate won’t work. It throws away the sender parameter, but you might want to test this. You can only test on one particular event being raised in a single test (e.g. can’t test that a function raises both the Opened and Closed events), but this may not be a bad thing as tests are not really supposed to assert more than one thing. I would be interested to know if anyone has a better way of testing that objects raise events. Am I missing a trick here? Any suggestions for how I can make my Raises function even better? I recently ran into some problems trying to embed a Silverlight application in a web page hosted on another server. It seems that to do so, you must have your MIME type for .xap files correctly configured (should be application/x-silverlight-app). Interestingly, this is not required if you are hosting the .xap file in a web page on the same domain. Unfortunately for me, my shared Linux hosting provider allows no way of configuring or even viewing the MIME types. After searching in vain for a utility that would let me have a look and see what MIME type a given URL was returning, I wrote my own test function. It turns out to be possible in just two lines of code – create a WebRequest, and examine the ContentType of the WebResponse. For some time, NUnit has had a RowTest attribute in the NUnit.Extensions.dll, but with NUnit 2.5, we have built-in support for parameterized tests. These reduce the verbosity of multiple tests that differ only by a few arguments. Another very cool feature is that you can specify a TestCaseSource function, allowing you to generate test cases on the fly. One way I have used this feature is for some integration tests that examine a folder of legacy test data files and create a test for each file. Now when NUnit loads the test assembly, it runs the GetTestFiles function, to get the test case parameters, allowing you to run them individually if necessary. There is one gotcha. If your TestCaseSource function takes a long time to run, you will need to wait every time NUnit (or TestDriven.NET) reloads your unit test DLL. So my example of examining a directory for files could negatively impact performance if there are too many test cases (I discovered this after loading 14000 test cases from a network drive). I went to my first “coding dojo” last night, which was also the first one run to be run in Southampton by Tom Quinn. You can read about what a coding dojo is here, but the basic idea is that a group of people collaboratively work on solving a basic programming problem, using TDD. To ensure everyone participates, developers are paired and work together for five minutes, before one leaves the pair and another joins. The task we attempted was to create a calculator that worked with Roman numerals. We started by listing some tests we wanted to pass. This I think was a good way to start, but we actually made very little progress in the first round of coding. Perhaps it was partly the awkwardness of coding in front of a group – fear of looking stupid, or fear of looking like a show-off - so no one was initially willing to stamp their own design onto the problem. The second time round the table it was a different story, with people eager to get the keyboard to implement their ideas. The other real problem was that we didn’t agree our overall approach to the problem. This was silly, because it was clear that we were going to have to make something to convert Roman numerals to integers, and something to convert integers back to Roman numerals. But because we hadn’t agreed that, we started off making the tests pass with hard coded results. It meant we ended up with 7 or 8 tests for the top-level object – the calculator, when really we needed some lower-level tests for Roman numeral conversion. It highlighted a TDD anti-pattern: doing “the simplest thing that could make the test pass” should not mean, “hard code return values for all the test cases”. If you do that, you may have passing tests but you are no closer to solving your problem. Positives: It was good to see everyone getting involved, and the idea of pairing worked well. It was also interesting to see how different people tackled the same problem. Suggestions: Perhaps enforce the “red-green-refactor” rule a bit more, so that the there is more focus on getting a single test passing before you hand on, and more emphasis on refactoring, rather than just passing tests. Five minutes is surprisingly short, and lots of pairs had to take over with the code in a non-compiling, non-working state. You could perhaps increase the timeslot to 7 minutes, although if there are more than 7 or 8 people present, you would be hard pressed to go twice round the room in a two hour meeting. If you had 10 or more people, it might make sense to break into two groups. Suppose you have an object that cannot be directly created by your IoC container. In my case, it is because that object is a .NET remoting object, so it must be created on a different computer. One way to solve this would be to register a factory that creates your object. But in my application, there are dozens of objects that need to be created in this special way, and they all inherit from a common base interface. Ideally, I would like it to be completely transparent, so I request the type I want, and the container works out that it needs to be built in a special way. So I set about making a Unity extension, which would allow me to intercept Resolve requests for certain interfaces, and create them using my custom factory method, or return the ones already cached. The way to accomplish this is to create a Build Strategy, which checks to see if the requested type meets our criteria. If it does, we have a look to see if we have already cached and constructed the object. If not, we call our factory method to construct it, and cache the result. One important thing to notice is that I pass the “Context” from the extension into the build strategy. That is so that if you call Resolve from a child container, it will return the same instance as if you called it from a different child container. Obviously, your requirements may differ. The if statement in PreBuildUp contains my rule for deciding if this is a Resolve request I want to intercept. Again, this could be customised for any arbitrary logic. I have been learning the Unity IoC container recently as we will be making use of it in a project I am working on. Like all IoC containers, it makes it nice and easy to automatically construct an object, fulfilling all its dependencies. One issue that comes up frequently when using IoC containers, is how to implement lazy loading. For example, suppose my class has a dependency on IEmailSender, but only uses it in certain circumstances. I might not wish for the concrete implementation to be created until I actually know I need it. One quick way round this is to take a dependency on the container instead. With Unity, the container comes already registered, so you can simply change the constructor prototype. Now you can call container.Resolve<IEmailSender> at the point you are ready to use it. The disadvantage of this solution is that we have now obscured the real dependencies of MyClass. It could ask for anything it likes from the container, and we have to examine the code to find out what it actually uses. Fortunately, there is a way we can solve this using Unity’s ability to allow you to register open generic types. Now we have advertised that our class depends on an IEmailService, but have not created it immediately on construction of MyClass, nor have we allowed MyClass to get at the IUnityContainer itself. I have been using Windows Live Mesh for over a year now, and I have to say it has become an invaluable tool for me. However, I do have a few feature requests I would like to see, to improve its usefulness and usability. The biggest risk with Live Mesh is that if you accidentally delete a file on one PC, it gets deleted on all PCs. So you must not think of Live Mesh as a viable backup option, even though it does replicate your files across multiple PCs. I would like to see an option for deleted files to go into a recycle bin in the cloud. So long as you have available space in your 5GB, it should be possible to restore files you have previously deleted. Obviously it should be possible to empty that recycle bin if necessary. The client software needs to give an indication of whether it is still in syncing or not. Often I make changes to a file at work just before I go home. I don’t want to turn the PC off until I know that the change has been uploaded to the cloud. In theory it should not be possible to inadvertently delete everything from a synced folder, but I managed to do so. I moved the parent folder which contained the Live Mesh folder to another drive, and moments later, the contents of the folder had been deleted on all my synchronized devices. Fortunately I was able to restore the data, but I would like Live Mesh to handle this scenario more gracefully. It should be possible to “ignore” certain files in a synchronized folder. This would be particularly useful for source code. You could do this at the subfolder level or by extension / filename matching. Finally, if Microsoft want to monetise Live Mesh, offering a backup solution with it would be ideal. This should keep not just deleted files, but could also store previous versions of files, allowing you to revert to earlier versions. On top of this, you could add a new type of Live Mesh folder, where you right-click and select that you simply want it to be backed up. Live Mesh would then upload its contents to the cloud, but the synchronization with other devices would not be needed. If it were reasonably priced, and you could control the scheduling of its bandwidth usage, I would definitely be interested. Can also add a "/s:" parameter to specify a TFS server, but seems to default to the right one for me. A while ago I blogged about how to display audio waveforms in WinForms. Porting this code to WPF is not as simple as it may first appear. The rendering models are quite different. In Windows Forms, you can draw points or lines using GDI functions. You are responsible for drawing them all every time the window is invalidated and its Paint method is called. However, in WPF, you create objects to put on a Canvas, and WPF manages the rendering and invalidation. My first attempt was to stay as close to the WinForms model as I could. I have a sample aggregator that looks for the highest sample value over a short period of time. It then uses that to calculate the height of the line it should draw. Every time we calculate a new one, we add a line to our Canvas at the next X position, wrapping round if necessary, and deleting any old lines. As can be seen, this gives a reasonable waveform display. I made use of a LinearGradientBrush to try to improve the visual effect a little (although this requires we cheat and keep the waveform symmetrical). There is a big performance problem however - it is very inefficient to keep throwing new lines onto a Canvas and removing old ones. The solution was to start re-using lines once we had wrapped past the right-hand edge of the display. This solves our performance issue, but I still wasn’t too happy with the visual effect – it is too obviously composed of vertical lines. I tried a second approach. This added two instances of PolyLine to the canvas. Now, we would add a point to each line when a new maximum sample was created. Again the same trick of re-using points when we had scrolled off the right-hand edge was used for performance reasons. As nice as this approach is, there is an obvious problem that we are not able to render the bit in between the top and bottom lines. This requires a Polygon. However, we can’t just add new points to the end of the Polygon’s Points collection. We need all of the top line points first, followed by all of the bottom line points in reverse order if we are to create a shape. The trick is that when we get a new sample maximum and minimum in, we have to insert those values into the middle of the existing Points collection, or calculate the position in the points array. Notice that I create a new Point object every time to make sure that the Polygon is invalidated correctly. This means that our minimum and maximum lines join together to create a shape, and we can fill in the middle bit. This tidies up the edges considerably. You can take this a step further and have a point every third pixel, but this highlights another problem – that our polygons have sharp corners as they draw straight lines between each point. The next step would be to try out using Bezier curves, although I am not sure what the performance implications of that would be. Maybe that is a subject for a future post. The code for these waveforms will be made available in NAudio in the near future. Often we want to modify existing software by inserting an additional step. Before we do operation X, we want to do operation Y. Consider a simple example of a LabelPrinter class, with a Print method. Suppose a new requirement has come in that before it prints a label for a customer in Sweden, it needs to do some kind of postal code transformation. Most developers would immediately gravitate towards going to the Print method, and putting their new code in there. This seems sensible – we run the new code at the last possible moment before performing the original task. And before we know it, we have a class where the original functionality is swamped with miscellaneous concerns. Worse still, it tends to become untestable, as bits of GUI code or hard dependencies on the file system etc creep in. This approach keeps our LabelPrinter class free from picking up any extra responsibilities, but it comes at a cost. Now we have to remember to always call our DoImportantStuffBeforePrinting method before anyone calls the LabelPrinter.Print method. We have lost the guarantee we had with approach 1 that no one call call Print without the pre-requisite tasks getting called. So where should our new code go? The answer is found in what is known as the “Open Closed Principle”, which states that classes should be closed for modification, but open for extension. In other words, we want to make LabelPrinter extensible, but not for it to change every time we come up with some new task that needs to be done before printing. This approach means that our LabelPrinter class keeps to its single responsibility of printing labels (and thus remains maintainable and testable). It is now open for any future enhancements that require an action to take place before printing. There are a couple of things to watch out for with this approach. First, you would want to make sure that whenever a LabelPrinter is created, all the appropriate events were hooked up (otherwise you run into the same problems as with approach 2). One solution would be to put a LabelPrinter into your IoC container ready set up. Another potential problem is the ordering of the event handlers. For example, checking if you have permission to print would make sense as the first operation. The simplest approach is to add the handlers in the right order. Always think about where you are putting the new code you write. Does it really belong there? Can you make a small modification to the class you want to change so that it is extensible, and then implement your new feature as an extension to that class? If you do, you will not only keep the original code maintainable, but your new code is protected from accidental breakage, as it is isolated off in a class of its own. I recently had need to create some HTML output from a .NET console application. Often in this scenario, I will simply crank out the HTML in code, constructing it bit by bit with a StringBuilder. However, this time round I decided to look for a more elegant solution. I wanted to create a text file with a template, and for my data to be dynamically put into the right place. While this could be done with XLST, or even some custom string replacement code, I decided to try out a .NET templating engine. There are a number of these available, including NHaml, Brail, and Spark, but I chose to go with NVelocity, whose syntax seemed to be nice and straightforward, allowing other developers to easily see what is going on and make changes to the templates. This proved harder than I was expecting. The original NVelocity project has not been updated in several years, but over at the Castle Project they have taken the source and are improving it. However, I couldn’t find a Castle Project download that contained a built DLL, so I ended up having to download the entire Castle Project source using Subversion, and building it. This is the nice and easy bit. Here you can see I am printing out a HTML table of books in a collection of books. I think the NVelocity syntax is pretty self-explanatory. Now we need to get hold of the template we created and load it into a stream. I embedded my template as a resource. Then we need to set up a VelocityContext, which will contain all the data needed to be injected into our HTML. Then it is a simple matter of creating the VelocityEngine and passing it the context and the template. It returns a string, which can be written to disk if required. One limitation that comes to mind is that I am not sure what would happen if the data contained characters that needed to be encoded for HTML (e.g. the less than symbol). I haven’t tested this scenario, but I am sure there is some way of working round it (especially as NVelocity is intended specifically for scenarios requiring HTML output). This is just a quick post to point out that I have had an article published on Coding4Fun this week. It demonstrates how to make a voice changing effect for Skype using NAudio. Check out the article here: Skype Voice Changer. I have now uploaded all the code (and release binaries) to a CodePlex project. The other thing to say is that the audio effect framework I developed for this application will eventually find its way into NAudio. I am still deciding on quite how best to integrate it, but watch this space for further news. Have fun talking to your friends in silly voices on Skype! In my previous post, I described a couple of options for creating a sound-wave icon graphic in XAML. While my final solution worked OK, I have since thought up an even simpler approach by using the XAML Path mini-language. The reason I didn’t initially go for this option was that I didn’t want to calculate the coordinates of each point. However, we can draw the shape rotated by 45 degrees first, which allows us to put each point nicely on a grid, and then use a RotateTransform afterwards to put it back. The M command starts us off by moving to the specified coordinates (0,0 in this case). A lower case h means a relative horizontal line – we move one unit to the right. Now the lower case a command means we are drawing an arc using relative coordinates. The first two arguments are the radius of the arc (1,1 = circle of radius 1), then comes the angle in degrees (90), then a flag indicating if this is a large arc – in our case, no (0), and then another flag indicating if we are going clockwise (1 = yes). Finally, we put the end coordinates (-1,1) which are relative to the starting point because we used a lower case a. This path is then closed with the Z command although this is not strictly necessary for us as we are not using a Stroke brush on this Path. Now we can draw the other three sections, each of which consists of a horizontal line followed by an arc, then a vertical line, and finally another arc with a smaller radius. I don’t bother with the Z because I have reached my starting point again with the second arc.